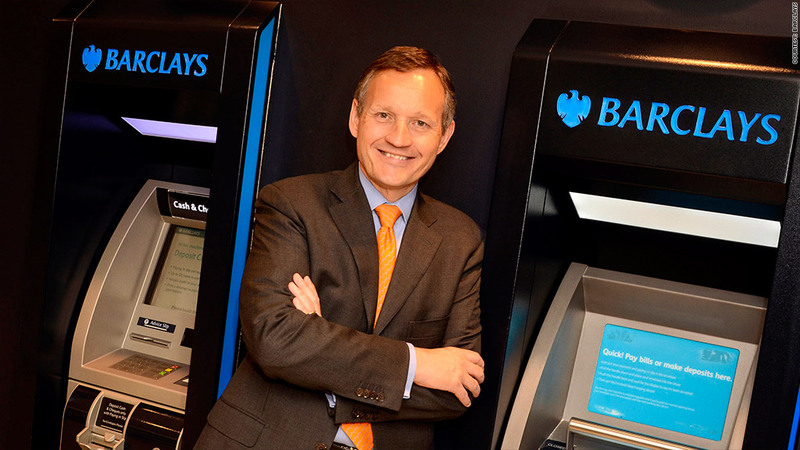 Barclays named Antony Jenkins, head of its retail and business banking, as its new CEO on Thursday. Barclays named Antony Jenkins as its new chief executive, turning to the head of its retail and business banking unit to lead it in the wake of the Libor scandal. Jenkins will assume the job immediately. Barclays has been searching for a CEO since Bob Diamond resigned two months ago, after the bank admitted its executives manipulated the Libor rate at the request of its traders and those of other major banks. Libor is a benchmark rate used to determine the interest paid on trillions of dollars worth of loans worldwide. Barclays' settlement with U.S. and U.K. regulators included paying $453 million in fines. The scandal also led to the resignation of Barclays Chairman Marcus Agius, although he stayed to run the company while Barclays conducted searches for a new chairman and CEO. David Walker, a financial and U.K. regulatory industry veteran, was named to succeed Agius as chairman earlier this month. Jenkins' statement once again acknowledged the bank's scandal. "We have made serious mistakes in recent years," he said. "We have an obligation to all ...stakeholders -- customers, clients, shareholders, colleagues and broader society -- and a unique opportunity to restore Barclays' reputation. That journey will take time, we have much to do, and I look forward to getting started immediately." But the Libor scandal is not the only one dogging Barclays. The bank also disclosed it is being investigated by the U.K.'s Serious Fraud Office for payments under certain commercial agreements between the bank and Qatar Holding LLC, an investment house in the Persian Gulf state. "Even for an industry mired in controversy, to have two investigations from the same organization -- the SFO -- on two different matters -- Libor and bribery -- is a questionable achievement," said Louise Cooper, an analyst with BGC Partners, in a note to clients Thursday. Cooper said that Jenkins will run Barclays in a very different way than Diamond, but that he faces challenges beyond simply dealing with the two scandals and probes. "The first job on Jenkins' to-do list must be to get a grip on the investment banking business that is still one of the biggest in the world and a significant profit generator for the bank," she wrote. "The loss of Bob Diamond was a big blow to this division, so the key profit generating staff need to feel confident in the new CEO. " Shares of Barclays (BCS) are down 6% since the scandal broke in late June, although they have rebounded from being down as much as 24% last month. Shares fell 1.4% in London trading Thursday following the announcement and were off 0.7% in early New York trading. Jenkins began his career at Barclays in 1983. He moved to Citigroup (C) in 1989, working in both London and New York. He became CEO of Barclaycard, Barclays' credit card unit, in 2006, and was named head of the retail and business banking unit in November 2009. The bank said Jenkins' base salary will be £1.1 million, while his bonus will be up to £2.75 million. That is significantly less than the deferred bonus of up to £20 million owed to Diamond at the time of his resignation, although he declined that bonus under terms of his departure agreement.